Rep. Birmingham left a closed door meeting of the Joint Rules Committee an hour after it convened in protest because he objected to the Garrett report being examined in star-chamber proceedings, the Springfield Republican reported May 7, 1930, p. 1, 3, 7. Birmingham argued that the report should be presented in public so that any person could speak about it, including Herbert A. Wilson, deposed Boston police commissioner. Wilson was fired by Gov. Frank G. Allen on May 5 following an investigation by Attorney General Joseph E. Warner into corruption charges involving the Boston police department and Oliver Garrett, head of Boston’s vice squad that was tasked with cracking down on bootlegging. Garrett was accused of extortion and racketeering while working on the vice squad. Birmingham placed blame for the problems in the Boston police department squarely with Gov. Allen and ex-Gov. Alvan T. Fuller, charging “laxity” in the administration of the department. The previous day, Birmingham had threatened to leave the committee room if the Wilson part of the Garrett report was discussed behind closed doors, a threat that he made good on. Birmingham told the newspaper that he favored the Garrett investigation originally. “The Republican rules committee, however, at that time had only two members in favor of the investigation originally, while four members of the Democratic party favored it. Rep. Leo M. Birmingham, Democratic House floor leader, assailed Mayor James M. Curley for pilfering city funds during House debate over whether to override Gov. Joseph Ely's veto of a bill to allow Boston to take a two-year hiatus on its annual contribution to the municipal retirement fund, reported the Boston Herald, April 1, 1932 (JMC Scrapbooks, Vol. 73, p. 4). Ely's veto was ultimately sustained by the House on a vote of 115 to 108, thanks in no small part to Birmingham's support for the governor's action. The original bill would have given the city the authority to withhold its annual contribution of $500,000 to the municipal retirement fund for 1932 and 1933, even though the city was required to make those contributions by law. The mayor argued that he needed to suspend the payments because of the depression. Birmingham said that the real reason the mayor was seeking to suspend payments was because he had wasted taxpayer money in paying high prices for goods. 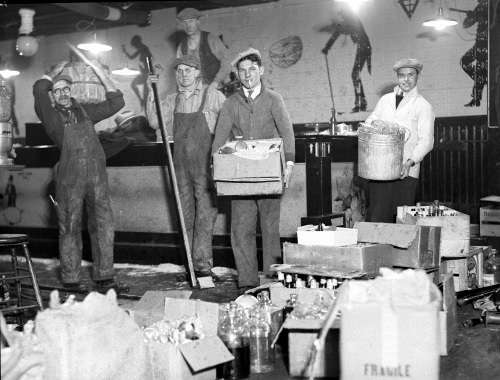 Birmingham said that the Mohawk Packing Co. had shut down after Curley’s second administration only to start up again when his current term began, implying that the company was a front for Curley to benefit from the excessive payments to vendors. Birmingham charged the mayor with “faking” because he had $4 million to “play with” and could apply part of that money for the annual contribution to the municipal retirement fund, avoiding a 26-cents-per-thousand tax increase. “Let the mayor undergo a moral reform and the city will save, not $500,000, but millions. Yes sir, I say if he’d stay at City Hall and stop his plundering and robbery he wouldn’t be here for this $500,000,” shouted Birmingham on the House floor, according to the Boston Herald. “He declared that he would not reduce the salaries of city employees but he put the gun on them and compelled them to give one day’s pay a month to go to the public welfare department. Is that a salary cut?,” Birmingham asked. “It’s more than a 10 percent cut. It was a ruthless, underhanded way of holding up the employees and done in a manner characteristic of everything he does,” the representative charged. Rep. Francis D. Dailey, a Democrat from the South End, defended the mayor and accused Birmingham of engaging in a political stunt. Dailey demanded that Birmingham produce evidence of the graft and corruption charges against Curley or other members of the municipal administration and provide that evidence to the district attorney or the state attorney general. Mayor Curley had directed an unsuccessful lobbying effort by municipal employees to override the governor’s veto, according to the Herald. Not one to let an insult pass, Curley took the occasion of a rally for Franklin Delano Roosevelt delegates at Warren Hall in Brighton, located in Birmingham’s district, to attack Ely and Birmingham, according to an account in the Boston Advertiser, April 3, 1932 (JMC Scrapbooks, vol. 73, p. 20). “No man has the right to prostitute the office of governor and prevent overriding of a veto which would have been for the interest of the men and women of Boston,” charged Curley. “Leo M. Birmingham, the man who was so vociferous in support of the governor’s veto, is the same man who was silent when the power trust bill was in the House in 1931. But he was vociferous in saddling 25 cents extra on the taxpayers and rentpayers of Boston. If the Legislature would have let us transfer that amount the 25 cents could be saved. In addition to that the legislature would not give us permission to transfer $500,000 from the cemetery funds. The city taxpayers will really pay 50 cents more than they should on the tax rate,” Curley said during the rally. According to the Boston Herald, April 3, 1932 (JMC Scrapbooks, vol. 73, p. 22), Curley said that Ely’s motive was to punish him for supporting Franklin D. Roosevelt over Al Smith for the Democratic presidential nomination. Ely’s veto of the bill was a “prostitution of the power of his high office to vent his personal spleen on me because I have dared to oppose his wishes and fight for the nomination of Gov. Roosevelt,” said Curley. Birmingham had joined with Ely to “crush Curley,” the mayor said. “You will pay $1 a month extra to your landlord because of the hostility of Birmingham and Ely to Curley and only because Curley had the temerity to support Gov. Roosevelt in this fight for the presidency.” Curley explained that rents would go up because the taxes on homeowners would have to increase to pay for city’s contribution to the municipal retirement fund.